One of the greatest skills gap exists for specialized positions such as machinists and technicians, according to a report by the Manufacturing Institute. And the shortage is expected to become even more pronounced in the years to come. Manufacturing jobs usually don't require advanced degrees, but they do need workers with solid math and science skills, and they require more emphasis on vocational training. 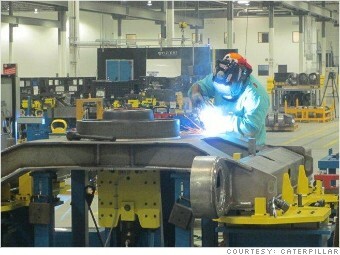 Caterpillar (CAT) is currently looking for entry-level welders at its new facility in Athens, Georgia. "Across the country there is a skills gap with high impact positions like welding. There is a shortage of workers because fewer people are interested in pursuing employment in the skilled trades, including in the welding profession," said Lisa Miller, a Caterpillar spokeswoman. Candidates must be able to pass the welder qualifications during their training. Entry-level welders start at around $15 an hour.